Had another appointment this morning. Ovaries are still big. As a matter of fact, they're touching on the inside. Bet you didn't know they could do that! Fluid is still down. He couldn't guarantee anything but it looks like I'm over the worst with the OHSS. It makes me nervous even typing that. The big news of the morning? He saw TWO sacs today. It's still too early for heartbeats but there are definitely two babies in there right now. Although we knew it was a possibility, it's still shocking. 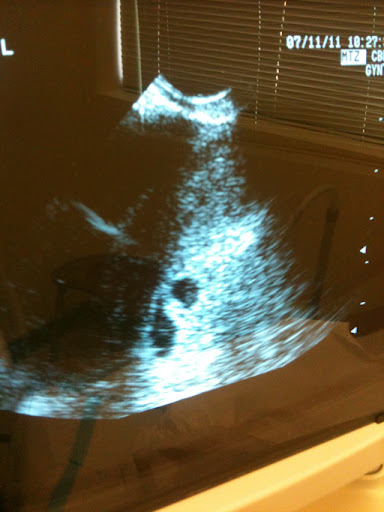 We have another u/s in 2 weeks to hopefully hear some beautifully strong heartbeats. I feel like I've been at the doctor so much lately that 2 weeks seems like an eternity! The only bummer is that he wants me to continue the PIO for at least another 2 weeks. I was looking forward to being done with those but it's a small price to pay. woohoo! SO exciting, april & brandon!! !